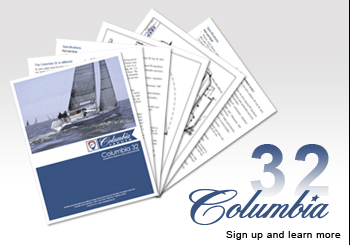 The interior of the Columbia Carbon 32 is modern and very functional. The interior is constructed from vacuum resin-infused carbon w/ PVC foam core. The sole of the cabin floor is laminate carbon fiber. There is standing headroom down below. The two aft quarter berths have adjustable leeboards. There are two additional berths in the salon. The Navigation table can be located on by the mast, or in an adjacent annex on port or starboard. The Head is located in a compartment forward of the mast. There is a simple but functional Galley area. There are integrated ice boxes on port and starboard .